August 2017: The charity of choice this year is the British Heart Foundation and we are raising sponsorship by running lots of miles! 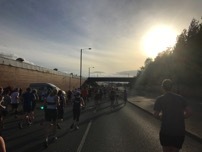 Check out our fundraising page if you would like to donate. July 2017: Our work on Agile + DevOps with Virgin Money has resulted in the development of a training programme that will provide experience to other Virgin Money staff moving into the new IT "Super Lab". Good luck guys! June 2017: For our June meetup we looked at the technical and cultural changes faced embracing DevOps by the squads at Skybet International. May 2017: The meet up for this month was in intro to the "cloud" and what it means for DevOps adoption. May 2017: DevOps Academy training this month took place in Paris. For details of our training expertise see our Training page. 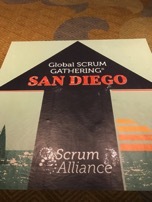 April 2017: Easter means……Scrum Global Gathering - San Diego! Our attendance at this event was both as an observer (with some great learnings) and as a presenter (Agile + DevOps = CD on steroids!!!). April 2017: Springtime is a time when many people change jobs so we invited some recruitment agencies to the DevOps North East April meet up to discuss the most in-demand skills. March 2017: Our new work Virgin Money is starting to deliver real results. The success of Agile and CD in the Mortgage Lab has resulted in Agile Coaches from Creative Agile working in the Savings Lab. March 2017: "Whose (pipe)line is it anyway?" The March 2017 DevOps North East meetup discussed the concept of "pipelines" and how they borrow heavily from manufacturing to enable continuous delivery (CD) to flow. We discussed what CD pipelines are, along with the tools that everyone is using, with a bit of audience participation along the way. February 2017: Deep technical dive at the February 2017 edition of the DevOps North East meetup group, with a look at Cloudformation from Amazon and Terraform from Hashicorp. We are at Campus North the third Thursday of each month and we are always on the lookout for speakers. January 2017: Scaled Agile is our first theme in 2017, working with one of our partners, Alani Consulting Inc., to deliver a tailored Scaled Agile (Scaled Agile Framework/SAFe) transformation at one of the Nordic's largest banks. If you want a feeling for what it is like operating agile "at scale" then look at the dependency board below! Agile delivers across 4 countries, 8 value streams and release trains, 50 teams…. 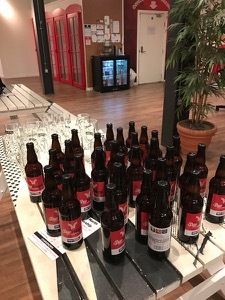 November 2016: The DevOps North East meetup group had its 1st Birthday this month and and SkyBet Italia kindly supplied a number of their "DevHops" beers, which were gratefully received. The talks focussed on Docker Swarm. November 2016: Our DevOps training "road show" continues and this month we have been back in Madrid. October 2016: Our "back-to-school" programme of events at the DevOps North East meetup continued this month with an introduction to "Infrastructure as Code". The event, held each month at Campus North was a great success with those starting out on their DevOps journey. September 2016: Our Agile and DevOps experience in the on-line gaming sector has gained us recognition and the award of a new contract with a leading provider looking to launch into international markets. Skybet have launched its new International team at the Electric Works office in the centre of Sheffield. Our work with SkyBet Italia is to help them launch new & innovative betting and gaming products into the Italian market. August 2016: And this is our annual holiday snap for 2016. July 2016: A must for anyone operating in the Enterprise/DevOps space (something that Creative Agile do a lot) the DevOps Enterprise Summit took place in London this month. With keynotes from Gene Kim (author of the Phoenix Project), Ron van Kemenade (whom we worked with at ING Bank), amongst others, the Summit was hugely important to show that DevOps IS possible in the Enterprise world. 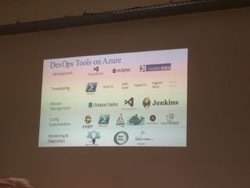 June 2016: For June 16 the DevOps North East meetup event returned to Campus North, a great venue supporting start-up's in the North East of England, and started with a light-hearted game of "Who wants to be a DevOps Millionaire" subsequently followed by a talk from the guys at Inframon exploring more about DevOps on Microsoft. 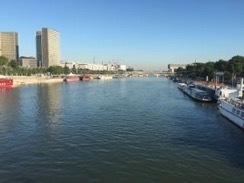 June 2016: Another location on our DevOps Academy training tour this month was the city of Paris. DevOps is a relatively new phenomenon in France so a lot of the concepts covered were a revelation for those present. We will run more training sessions in Paris in the future but if you would like to arrange a session now see our Training page. June 2016: Our work with Virgin Money continues to bear fruit. This month featured the launch of their new Intermediary Portal. This portal, built using Agile techniques and deployed onto a Cloud-platform, a first for this bank, was launched following successful pilot. The portal is available at https://www.virginmoneyintermediaryportal.com and provides a rich web-based experience for Mortgage brokers. May 2016: Our DevOps North East meetup event for May 2016 was on "Windows DevOps" which was new and unfamiliar ground for most attendees. Microsoft can never be ignored so it was fascinating to find out more about DevOps in Windows-land. May 2016: Our Accenture DevOps Academy training tour continued this month with back-to-back courses in London. For more details on our DevOps training, see our Training page. April 2016: The DevOps North East meetup this month was on "Visualising your Service - Beyond the black box" and "Whipping your WIP". Sponsorship and support from Equal Experts was welcomed. April 2016: This month we are running the Accenture DevOps Academy in Madrid, the capital of Spain. March 2016: The DevOps North East meetup this month focussed on "Lean thinking" and how it influences DevOps, as well as "Orchestration" with an overview of Docker Swarm. February 2016: Our banking sector expertise continues with the addition of a FTSE-250 bank to our client portfolio. We are now trusted to introduce Agile and DevOps through a "lab" concept to this household name bank. 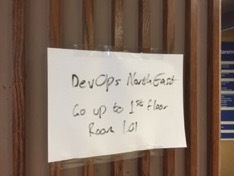 January 2016: We are now running the DevOps North East (D.O.N.E.) meetup group, a regular gathering of those people (technical and business) with an interest in all things DevOps from in and around the North-East of England (Newcastle, Sunderland, Durham, etc). 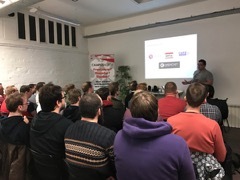 The January 2016 meetup was at the offices of Bede Group, a leading developer of gaming software, and covered "Getting started with DevOps" and "Measuring DevOps success". December 2015: Our training expertise is now trusted by Accenture and we now help run the "Accenture DevOps Academy". We work with so many people from different Accenture offices and different projects across the world and share our knowledge and experience as part of a two day interactive training course. For more details on our DevOps training, see our Training page. November 2015: Docker seems to be taking over the world! As the pre-eminent container technology, still only a two and a half-year old company, we thought it wise to attend Docker Con 2015, the conference for Docker users. Suffice to say it was amazing. The way in which Docker can package up ("containerize") your deployment needs and scale them to meet your demand. Docker as a technology will feature more and more in our approach to DevOps strategy and consulting, as well as being an integral part of our training offer. September 2015: Our portfolio of enterprise clients continues to grow with recent DevOps projects taking us to a London-based FTSE-100 company looking to exploit DevOps across their global enterprise. Through a combination of Version Control, Automated Deployment, the Cloud and Agile we have transformed the global IT delivery capability of this prestigious organisation. July 2015: The DevOps Institute are running a range of courses that allow individuals to become DevOps Certified. We have been working with strategic partner and REP (registered education provider) Ranger4 to deliver a fun and engaging mixture of DevOps theory, and real world practice, to help attendees succeed in their training. For more details on our DevOps training, see our Training page. June 2015: The inaugural Creative Agile golf day took place this month at Whickham Golf Club, a course with which we have a long association and where we are proud to sponsor a very tricky par 3 hole. Golfing enthusiasts from across our client base came together to enjoy a mixture of fourballs, despite the damp conditions. May 2015: Another new client has partnered with us this month over in the Netherlands. We are working with a major Dutch Investment Bank on their "continuous delivery" agenda. By providing experienced CD Coaches we are helping with the delivery of "version controlled production assets", "continuous testing/test automation" and "deployment automation", amongst a range of other corporate CD items. April 2015: We attended the Scrum Coaching Retreat taking place in Pattaya, Thailand, this month and spent some quality time with the best Agile coaches in the world. A fantastic venue provided the backdrop to some interesting and challenging discussions on the role of the Agile coach in an organisations transformation. 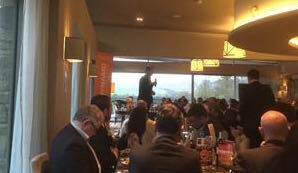 March 2015: The North East of England is gaining an international reputation for Digital and IT and to support this growth we have joined Dynamo North East. As members of this prestigous organisations we help employ, train and develop the very best local talent to help "grow the North East IT economy". February 2015: Working with our strategic partner Ranger 4 ("DevOpsTastic!") we have worked with a number of major enterprises this month to help "lift-off" their DevOps journey. This approach to "boot strapping" the Development and Operations teams is thoroughly recommended. January 2015: The signing of a new major client has taken some of our staff out to Sweden. Here we are helping a major retailer with their digital e-commerce improvement by using CA's DevOps toolset. Whilst not endorsing any particular technology vendor or stack, the CA Service Virtualisation tools certainly provide real value to development teams wholly dependent on (often legacy) "back-end" systems. December 2014: Our founder is now a Certified Scrum Professional - one of only a small handful operating in the UK. If you want Agile and Scrum coaching or support from the best in the business then please get in touch. November 2014: Our contribution to the Agile community continues apace. We invest heavily in the Agile North East community gathering and have this month gave a presentation on Agile + DevOps = Continuous Delivery on Steroids!!! October 2014: Application Performance Management is something that is at the heart of a living, breathing, infrastructure eco-system. We have used agility to introduce this kind of tool to a couple of clients in this calendar year, with a focus on the App Dynamics product range. This has allowed our clients to pre-empt failure in their infrastructure and deal with it as part of a sprint-based Scrum approach. Our approach to any tooling rollout is to follow our heart - Agile and Scrum - and incrementally build value adding features with the tool. September 2014: We do a lot of fun retrospectives with our clients, as part of their ongoing Scrum journey, and we've pulled together (and blogged about here and here) some of our best ones. In our eyes the retrospective is both a way to improve the way a team is operating (the "how", not the "what") and a chance for the team to dis-engage, relax, speak freely, and truly bond as a team. August 2014: Our most recent speaking engagement took us to the Velocity conference in Beijing. We have earmarked China as a market that is ripe for DevOps, SCRUM and Continuous Delivery, with the pre-eminence (and IPO's) of some major digital players coupled with a massive start up community countered by the recognised challenges in moving China into the cloud. Our work on profiling continuous delivery within organisations in the UK and Europe certainly received some attention with over 40 people in attendance at our session. July 2014: This month we have helped a client with their challenges embracing MongoDB in a continuous delivery pipeline. Mongo is a fantastic NoSQL "database" with unparalleled flexibility and performance when underpinning new age digital infrastructures. However there are some challenges when embracing continuous delivery and multiple daily deployments to production - data persistence across deployments in a continuously delivered live environment is both a headache and an opportunity and we have worked to assist the client build the technical and managerial capacity to make it happen. June 2014: Our annual charity challenge for 2014 is "Joppa for Jo", which will take place at the end of June. A group of MAMIL's (middle-aged men in lycra! ), including our very own founder, will be cycling from Newcastle to Edinburgh, 210 miles across 3 days, following the "coasts and castles" route" in memory of Jo O'Hara, and helping Cancer Research UK. To support this worthy cause see the fundraising page. May 2014: Careers update. Our drive to recruit Developers with Scala skills and Testers with Selenium skills is gathering pace. If you have skills in either of these areas and are looking for a fresh challeng, get in touch via our Careers page. April 2014: This month featured another guest speaker appearance for Ranger 4 this time on their webcast about using Agile with DevOps. Both are modern trends in software and service development and the webcast goes on to explain how organisations can get the best of both worlds by building a continuous delivery capability, using DevOps, but in small, incremental bursts of development using Agile. March 2014: Our founder was a DevOps specialist guest speaker for Ranger 4 this month on their webcast about the DevOps Maturity Assessment (DMA) process. The assessment is used to benchmark organisations and provide a baseline for their ability to adopt DevOps and Continuous Delivery. The resulting index is based on cultural, process, organisation and tooling factors and can be used to identify areas for improvement (and measure progress towards that improvement). February 2014: Old dog, new tricks.... This month we have been working with a client operating in the financial services market who depend heavily on IBM iSeries (was AS400) processing capability. Not unsurprisingly the "big boys" (IBM, HP, CA, etc.) have invested heavily (either by acquisition or by R&D) in the DevOps and Continuous Delivery space and it was good to work with experts from IBM to compile a DevOps strategy and architecture for this client. The Rational toolset was pivotal in lining up the business with development and operations and introducing automation, and Urbancode was a fundamental plan in enabling continuous delivery/deployment. No matter what your platform, we have a DevOps story for you. January 2014: DevOps days are becoming commonplace around the world, reflecting the grass roots basis of the movement which is now being increasingly strategic in large corporations. This month we've been to Leeds DevOps, where some good beer was shared with some good discussion around DevOps. December 2013: As part of our on-going focus on the end-to-end value chain of Continuous Delivery our consultants have been working with automated deployment tools (such as the DeployIT tool, available from Xebia Labs, and the Rapid Deploy tool, available from Midvision) on cloud providers (both Amazon Web Services and SkyTap) to prove how they can streamline the processes of continuous cloud deployment. To retain our objectivity we do not go in for partnership agreements with vendors. Realising the value chain of continuous delivery within organizations (concept-to-cash) is often about removing constraints - and a combination of these (and other) tools and providers ensure that getting solutions into the cloud need not be a headache. November 2013: Our team attended DevOps Day London on 11th and 12th November, 2013, an event that was absolutely jam packed, highlighting the growing nature of the DevOps movement. A particular highlight was the keynot from Mark Burgess, founder of CF-Engine, on the science behind infrastructure automation. Puppet Labs, the automation software provider, were also in attendance from "across the pond" (they also ran Puppet Camp London 2013) focussing on the growing importance of London as a worldwide DevOps hub. October 2013: The VMworld 2013 show in Barcelona this year was "fantastico". In particular the VMware network virtualization technology , NSX, looked awesome. The massive administrative challenges that face large web-scale organizations can be abstracted using generic configurations and this can be applied to fast moving network topologies. September 2013: We have now rolled-out Agile/SCRUM processes to 500 people (and counting) across the many organisations we have worked with. We still sometimes advise teams to use manual systems for this, however both Jira and TFS 2012 ALM, are enabling technologies we have used. August 2013: We are at Puppet Conf 2013, in San Francisco, listening to some great keynote speeches and getting some “deep drive” training from one of the industry leaders in infrastructure automation. July 2013: To demystify some of the concepts and buzzwords we use, but take for granted, we have now posted some links to Wikipedia. DevOps, IaaS, PaaS and SaaS should now be fully explained.